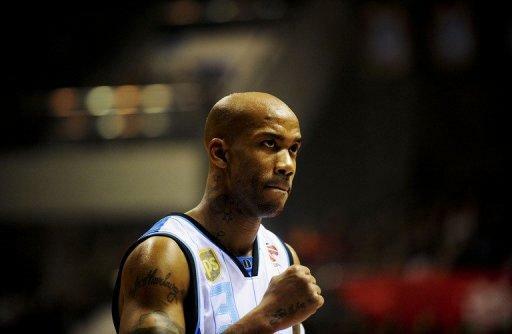 Former NBA superstar Stephon Marbury led the Beijing Ducks to their first-ever Chinese championship Friday, scoring 41 points as the host team knocked off title holders Guangdong Tigers 124-121. Fellow American Randolph Morris sealed the victory for Beijing, hitting two free throws with 21 seconds left on the clock, while a three pointer by Guangdong's Aaron Brooks was wide of the mark as time expired. "This has been incredible, it has been an incredible experience," a tearful Marbury said after winning his first major league championship. "This shows what this team is made up of, everyone stepped up and everyone played their role. We have been blessed as a team." Marbury, the former New York Knick, led a balanced Beijing attack in a physical contest played before a capacity crowd of 18,000 in the capital, with six Ducks scoring in double figures. In their first-ever Chinese Basketball Association (CBA) championship, the Ducks beat southerners Guangdong, winners of the last four straight league titles, five games to one in the best-of-seven series. Marbury, who has led Beijing all season with his scoring and play-making, ended up with 41 points on the night for the winners, while Zhai Xiaochuan scored 22, Zhu Yanxi contributed 16 and Morris notched 14. With the game tied at 121-121, Marbury fouled out with one minute and twenty seconds left, silencing the capacity crowd and leaving everyone wondering if the team could hang on for the win and avoid a game six in Guangdong. "We believed, we are a team, Stephon carried us the whole game, but when he fouled out everyone knew that we had to step up to win," Morris said. "It was our defence again, we blocked shots and we didn't give them the shot they wanted." Guangdong was led by Brooks with 33 points and another American, James Singleton, with 29. Marbury, a two-time NBA All-Star, has reinvented himself since arriving in China in 2009 following a tumultuous 13-year NBA career that saw supreme talent on the court but often poor behaviour off it and various spats with coaches and team-mates. But in China, the multi-millionaire has led by example, taking his gritty, muscular game and infecting a roster of young Beijing players with fight and tenacity. He has also embraced the culture while working to sell his "Starbury" brand of shoes and sports apparel with a "love is love" marketing campaign.